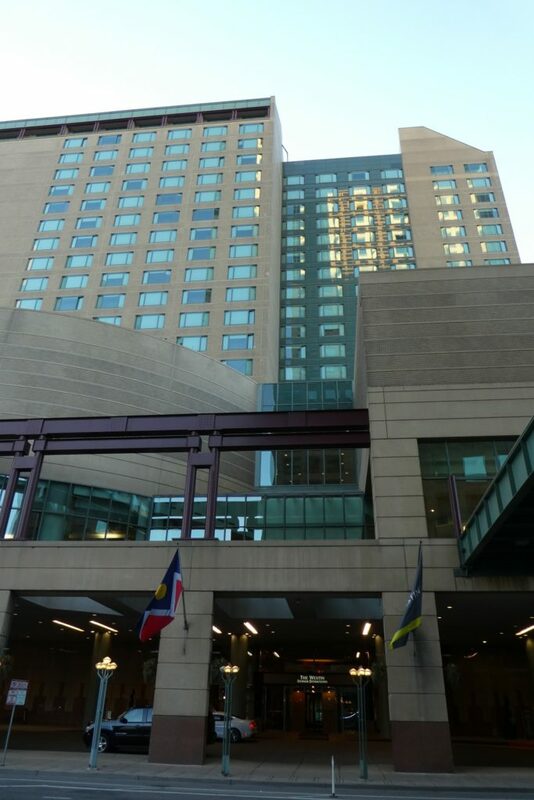 Photo by Jamie Bartosch/Suburban TravelingMom The entrance to the Westin Downtown Denver. Denver’s new train line, which goes from the airport to downtown’s Union Station, takes only 37 minutes and costs $9 per person. Once at Union Station, you can roll your bags a few blocks to the Westin Downtown Denver. The hotel’s excellent location is one of many many reasons I think it’s a great choice for families visiting Denver. Read on to learn more. 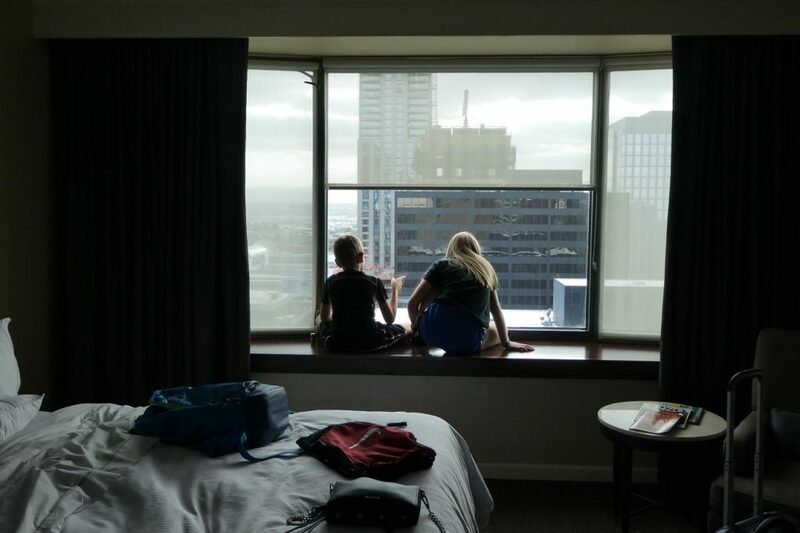 Taking in the views from our room at the Westin Downtown Denver. 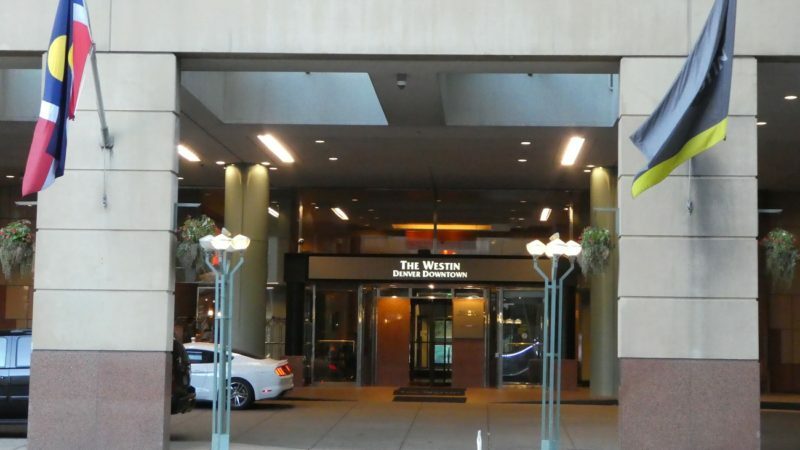 The Westin Downtown Denver is close to Union Station and just a half-block from the 16th Street Mall bus. Between the rental car cost, gas, and $40/night to park in the hotel garage, I’m guessing we saved about $200. 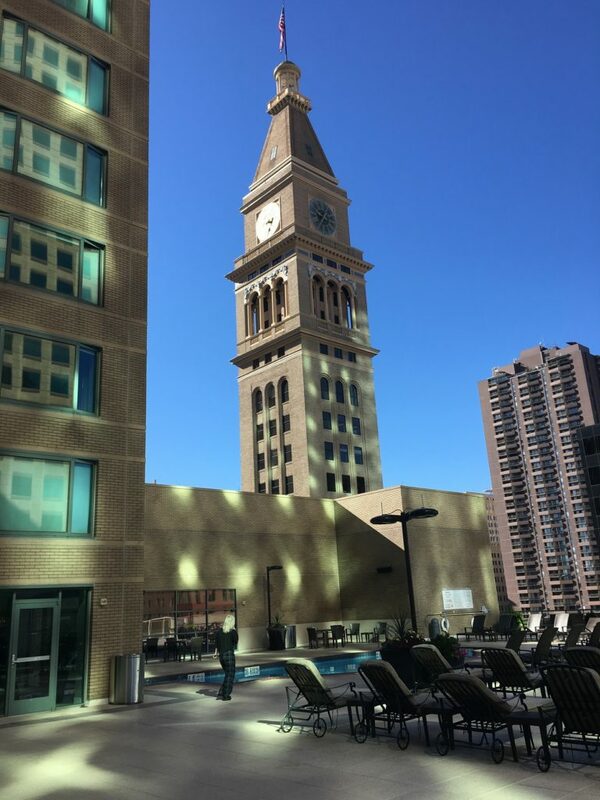 The Westin Downtown Denver is a half-block away from the free 16th Street Mall bus, which goes up and down a 1.25 mile stretch of restaurants and shopping in “LoDo” (Lower Downtown). To go beyond that, we easily Ubered around the city. This Westin hotel has more going for it than just location, location, location. Here’s what we thought following our September 2016 visit. Everything! This hotel hits my four must-haves when traveling with kids: clean, quiet, updated, and a nice pool. The indoor/outdoor pool is on a 4th floor, and is surround by skyscrapers. There are also tons of nice wicker lounge chairs to relax in, and a staffed bar (even at noon). The hotel’s new Westin Family program gives a 25% discount on a second room, connecting rooms, and free meals for kids under 12, with purchase of an adult entree. 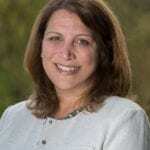 As one who is trying to live healthier – and not using travel as an excuse to eat badly and skip exercise – I adore their Move Well menus and amenities. More on that later. Another feature that works for families is their in-hotel Starbucks, which has lots of grab-and-go snacks. I’m struggling to come up with anything to include here – maybe that the pool doesn’t have any shallow areas? Or pool toys? So it’s not the greatest pool for little kids. But for my 11- and 13-year-old, it was perfect. Skyscrapers, including the historic D&F Tower, surround the pool at the Westin Downtown Denver. Start at $189 a night. Westin is a mid to upper-mid hotel chain, so you’ll have a lot of nice services and amenities. One of the chain’s best features is their Move Well wellness program, which emphasizes healthy living. Hotel guests can meet on certain mornings and go for 3- or 5-mile runs as a group through the neighborhood (there was a sign in our lobby). Sounds like a nice way to meet people if you’re traveling alone and don’t want to run outside by yourself in an unfamiliar town. 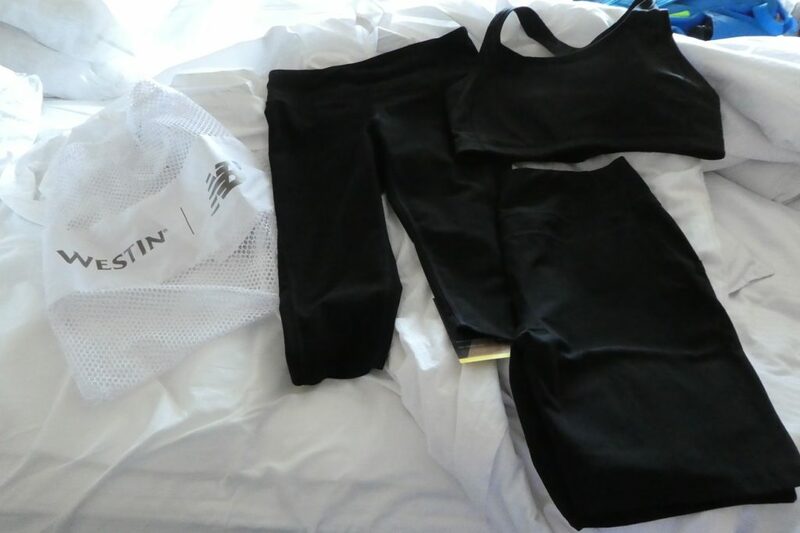 The like-new New Balance workout gear I rented for $5 at the Westin Downtown Denver. They also rent athletic shoes. Move Well also provides free in-room workout videos (and treadmills in some rooms! ), really nice gyms, and special food menus. During this stay, I tried their workout gear lending program. It may sound gross, but it’s not at all. We were in Denver for a wedding, so we had lots of extra shoes in our carry-on. No room for workout gear? No problem. I called the front desk, and within 15 minutes, someone had brought up to my room what looked like brand new New Balance workout gear. There was only a $5 charge to borrow it, and all I had to do was leave my sweaty clothes in a laundry bag in the room. It couldn’t have been any more convenient, or awesome. I’m going to use it every time I stay at a Westin from now on. No more packing my bulky gym shoes! 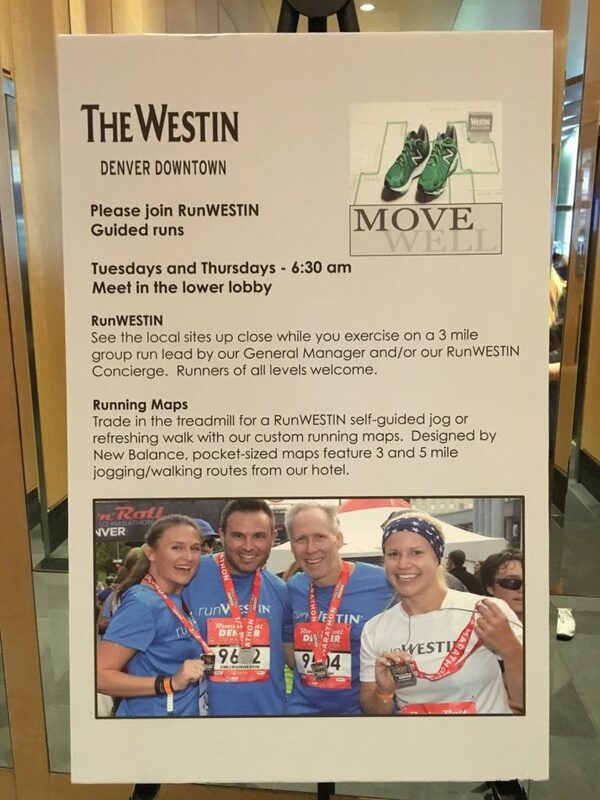 Group runs are offered as part of the Westin’s Move Well initiative. The rooms were spacious, clean, with lots of easy-to-reach outlets – something that’s important for a family with multiple cell phones and iPads. The Westin’s famous Heavenly beds lived up to their name. Our room had a view of the D&F clock tower, which was beautiful. 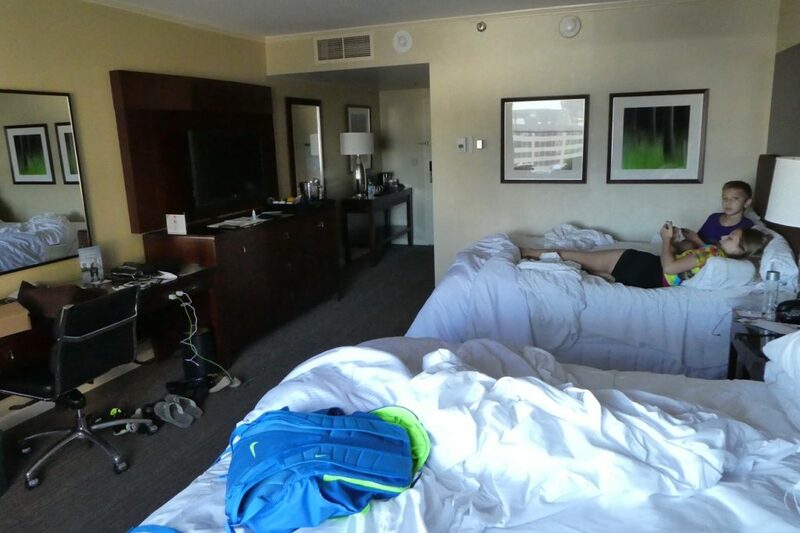 A messy, relaxing morning in our spacious and comfy room at the Westin Downtown Denver. There is no breakfast buffet available, but there is a Starbucks in the hotel, with lots of good grab-and-go options. We didn’t eat at the hotel’s main restaurant, The Palm, which opens at 11 a.m. But I was impressed that The Palm’s menu included an Eat Well menu for both adults and kids. A few blocks down 16th Street is a great kid-friendly restaurant, The Melt. My kids LOVED the mac & cheese, and grilled cheese sandwiches. Try the grilled cheese made with mac & cheese.